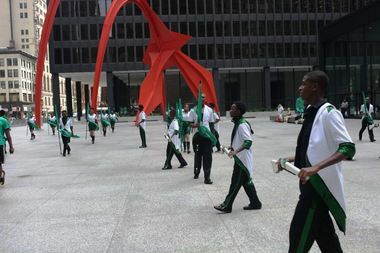 The South Shore Drill Team rehearsing its upcoming performance at Federal Plaza, 230 S. Dearborn St. THE LOOP — Loop commuters who walk by Federal Plaza can see not one, but two shows Friday afternoon. The South Shore Drill Team will perform five-minute sets at 5:30 and 6 p.m. Friday at the plaza, 230 S. Dearborn St. The drill team, which is celebrating its 35th anniversary this year, teamed up with Los Angeles-based architect Bryony Roberts for the performances, which are part of the three-month Chicago Architecture Biennial kicking off this weekend. The performances are "a way of reinterpreting that architecture through physical movement," Roberts said. The plaza's original architect, mid-century sage Mies Van Der Rohe, built the plaza as an intentionally wide and flat public space between narrow skyscrapers. The drill team's presence represents the public inhabiting that space owned by the government. "The piece is basically asking the question, 'What would happen if institutions from the South Side remake a space of architectural heritage in The Loop?'" Roberts said. "These young kids are normally people who aren’t given the agency to remake architecture like that, and made to feel uncomfortable in faces of national or local government." The piece is titled "We Know How to Order," an ode to a Gwendolyn Brooks poem about black World War II soldiers given a system of orders to "give them protection against enemy warfare, but it doesn't," Roberts said. About 40 young people will perform Friday, said Sara Vlajcic, the administrative director for the drill team. She said they were referred to Roberts by a mutual University of Chicago contact. The partnership "kind of pushes our kids to do something different, but also for our kids who did 104 performances last year, if they just did the same events over and over they would get bored," Vlajcic said. But Loop commuters passing by shouldn't expect boredom Friday. "It’s going to be an amazing surprise for them and that’s what we like: We like to surprise people," Vlajcic said.